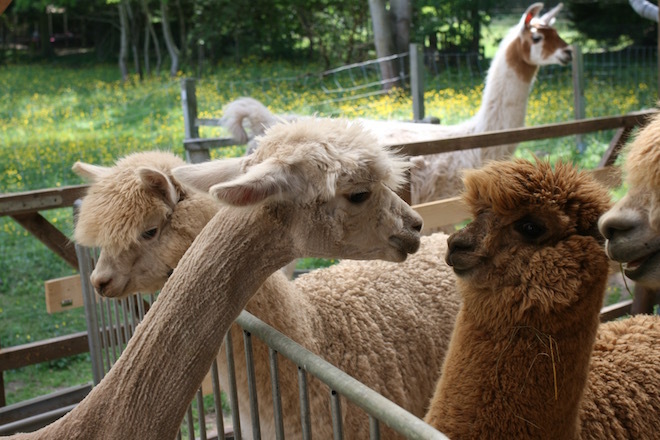 When I cycle the surroundings of my hometown Saarbrücken I often drive past a small farm where alpacas are grazing. Unusual animals for my region. Normally you met cows or maybe horses. Of course, as a knitter and yarn lover, I was curious. And as a blogger, you are allowed to be curious. So one day I stopped by at Saar Alpaka and asked if I could come and visit, take pictures and ask questions. I went in May for the first time. 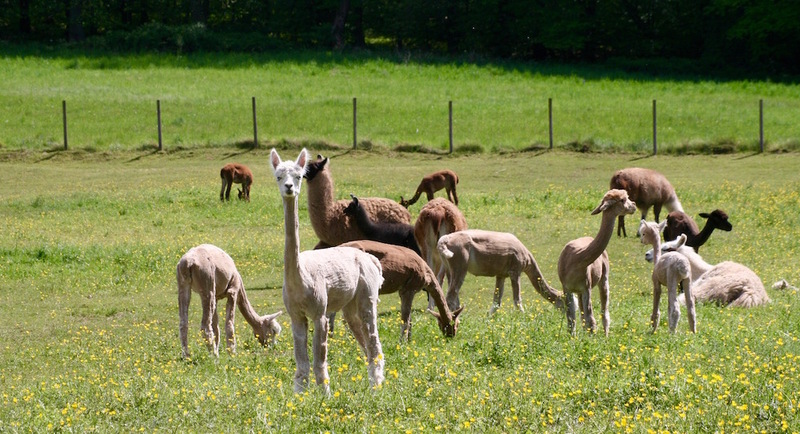 That day the alpacas were shorn. 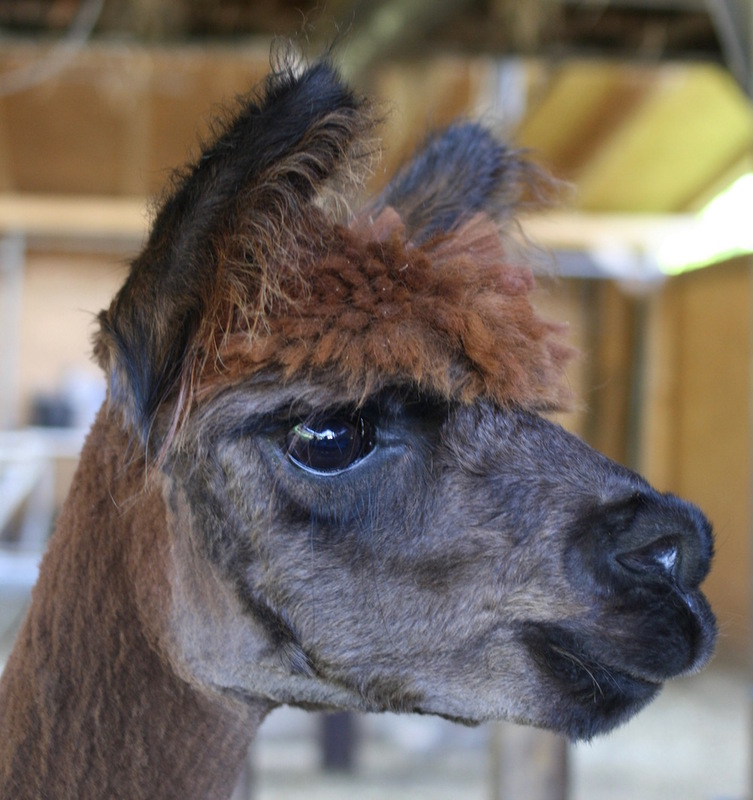 Saar Alpaka is a rather small farm with 47 animals. The proprietors Christiane Groß and Rainer Frenkel started the farm in 2009. A farm shop was added about 6 years ago. 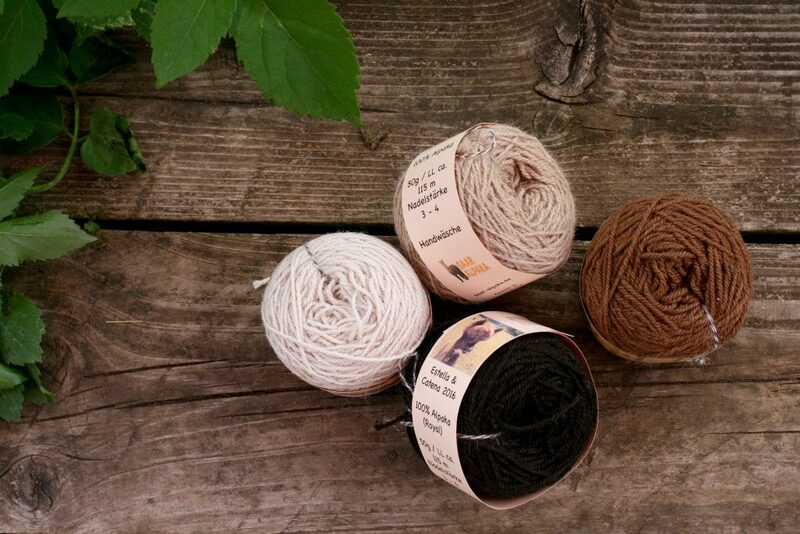 It has a small, but exquisite selection of yarns grown mostly grown on their farm, but also a selection of other alpaca yarns. Hey, you can see my neck! Where is yours? Shearing day was a busy day. 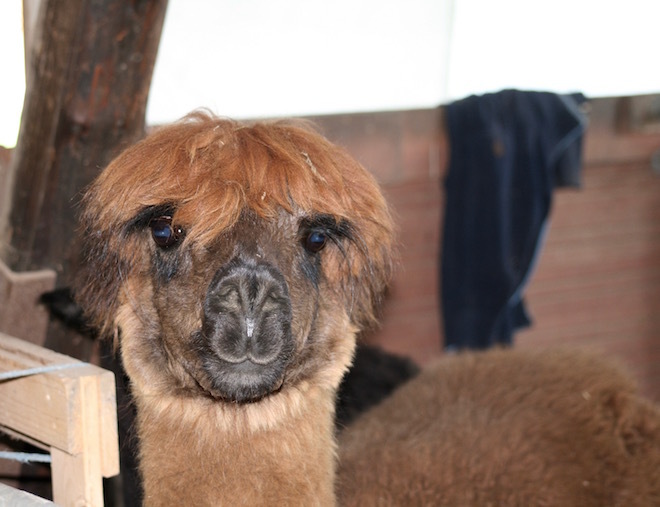 All 47 alpacas had to be shorn in two days. 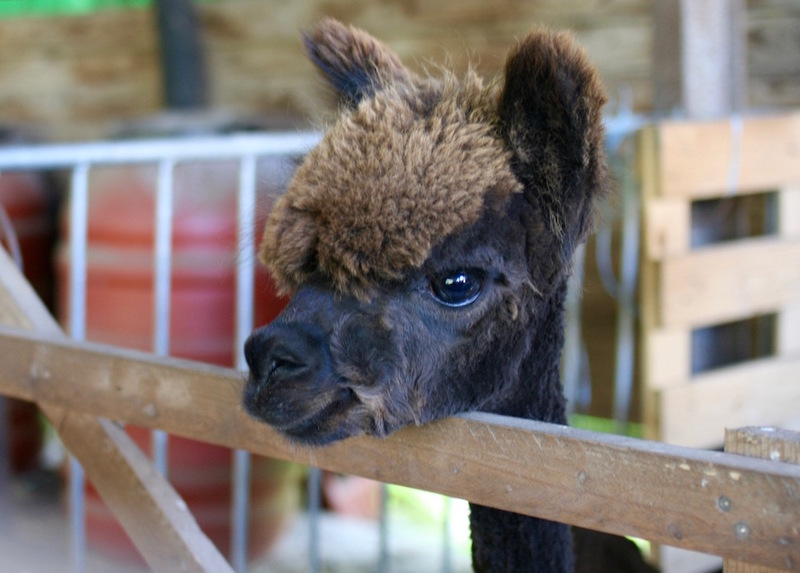 Alpacas are shorn once a year in late spring. Their fleece is thick and with good insulating qualities. It keeps them very warm, good in winter, but a no-go in the warmer months. 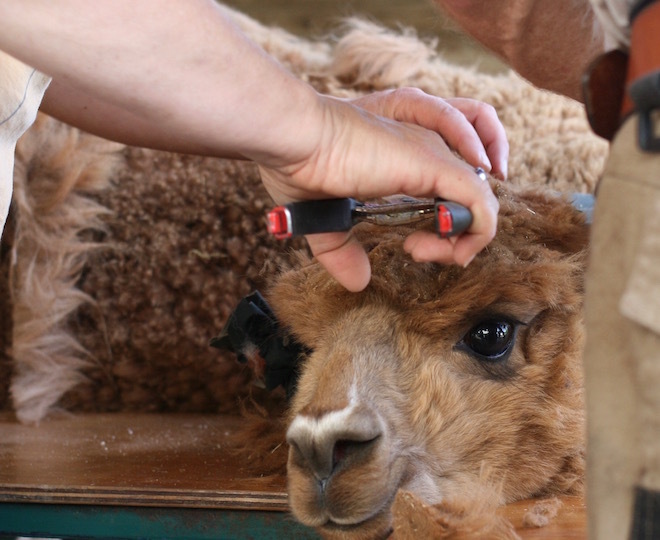 The alpaca stud Tinkerbell is quite relaxed while getting a new haircut. An important day for little Thor. He was shorn for the first time. Afterwards, he had to say goodbye to his mother and joined the stallions at the boy’s range. 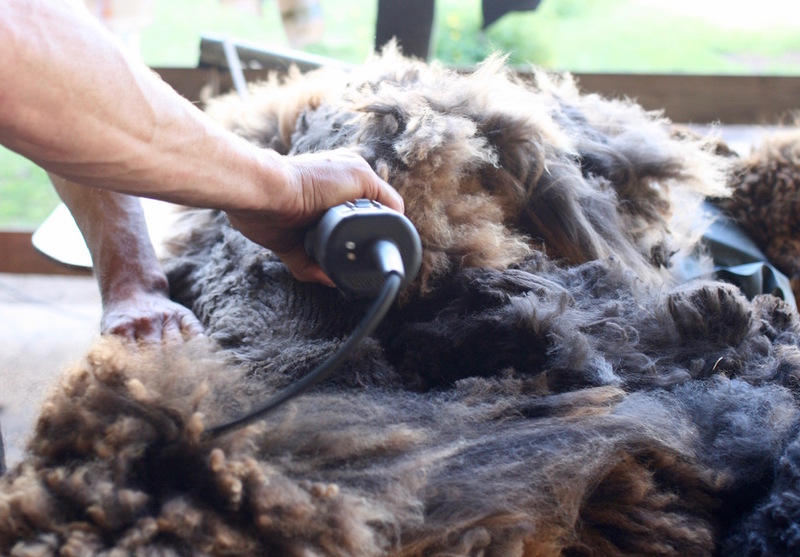 It was already really warm in May, so the animals seemed to be happy to be rid of their fleece. While the alpacas enjoyed the new comfort of a short fleece outside on the range for Christiane and Rainer the work continued. The fleeced had to be cleaned and sorted. Samples of each animal are sent to a laboratory in order to check the quality, i.e. micron and comfort factor of the fleece. Christine then decides, which fleeces will be spun together depending on the quality and colour. 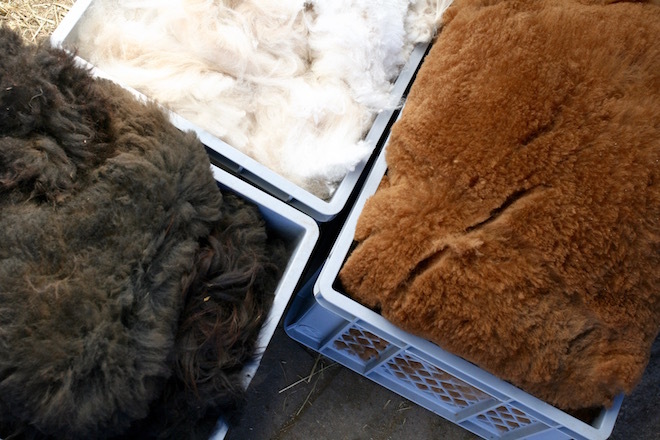 The fleeces are sent to a mill in Southern Germany that spins also small quantities. There the fleece is washed and carded. And spun to a nice and soft, but sturdy DK-yarn. Natural and sustainable: 50 gr cakes of undyed Saar Alpaka. 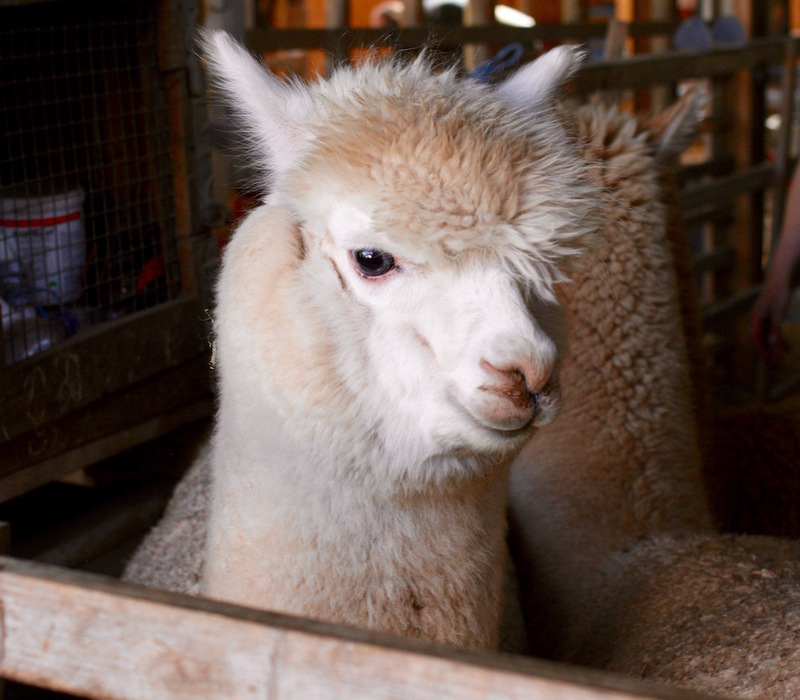 Depending on the animals the quality of the yarn is either Royal Alpaca with a micron below 19 or Baby Alpaca with a micron under 23. I can tell: it is very soft and smooth. On Saar Alpaka’s labels, you can read the names of the alpacas that are responsible for your yarn cake: Leo, Inti, Rosi, Estella, Angelo… I like this idea. 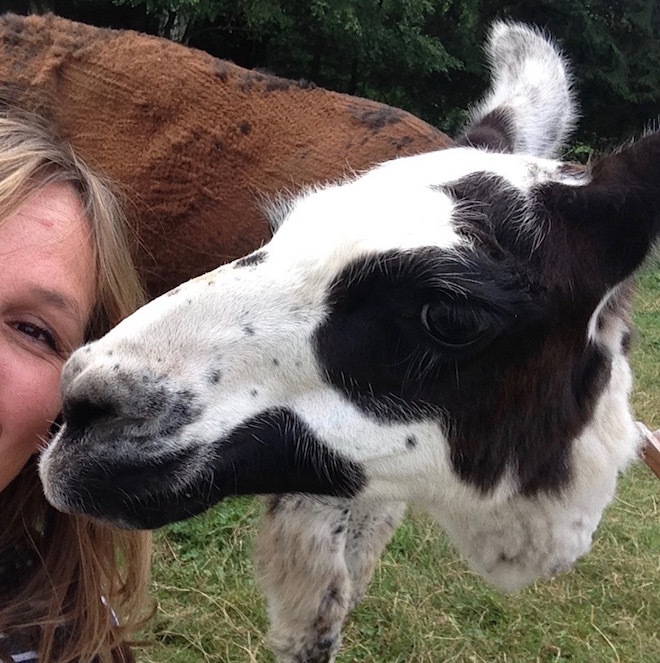 If you want you can visit the animal who grew your yarn and say thank you. Maybe with a small treat? Angelo’s fleece was abundant: 1.2 kgs of the first choice. 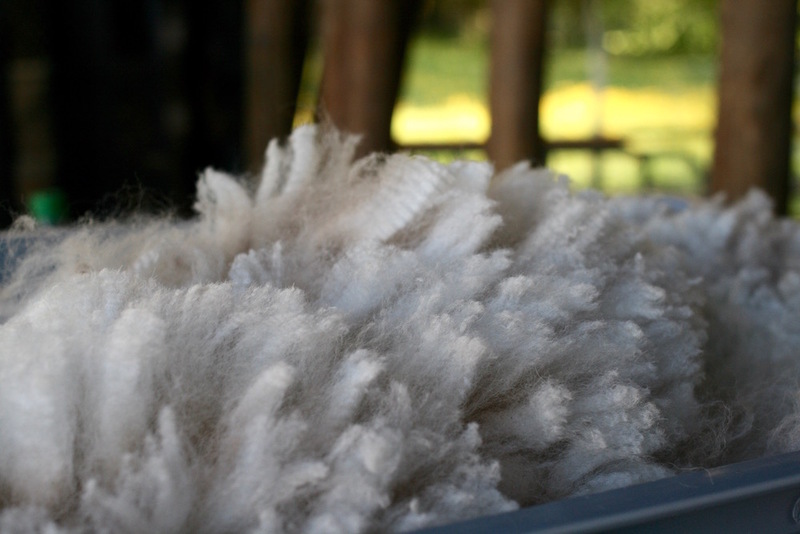 Close up of Angelos lustrous fleece: You can see the crimp that is considered a sign for high-quality fibre. Before the make-over, Tatamia was sporting a retro-look with a 60ties fringe. For summer Tatamia is now wearing a short, layered fringe for a fresher look. 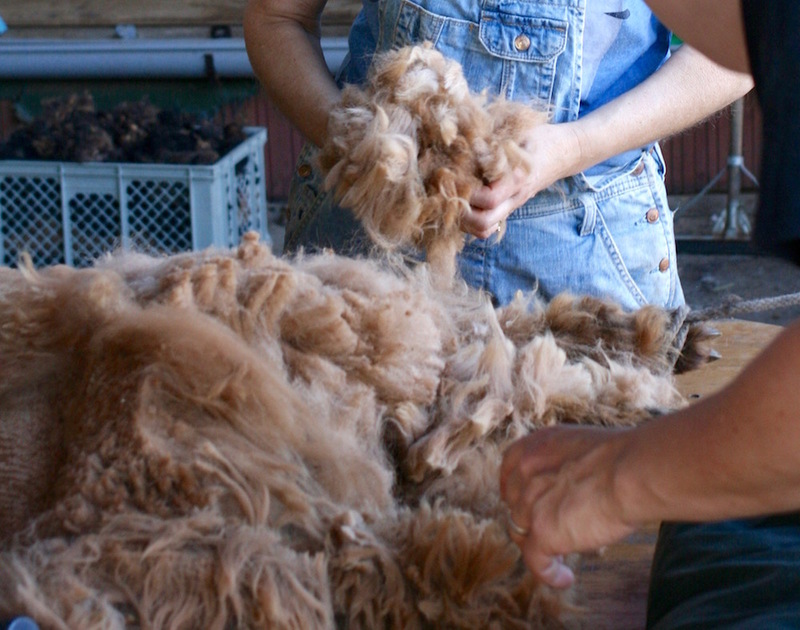 While the first choice is spun to yarn, the rest of the fleece is not discarded. 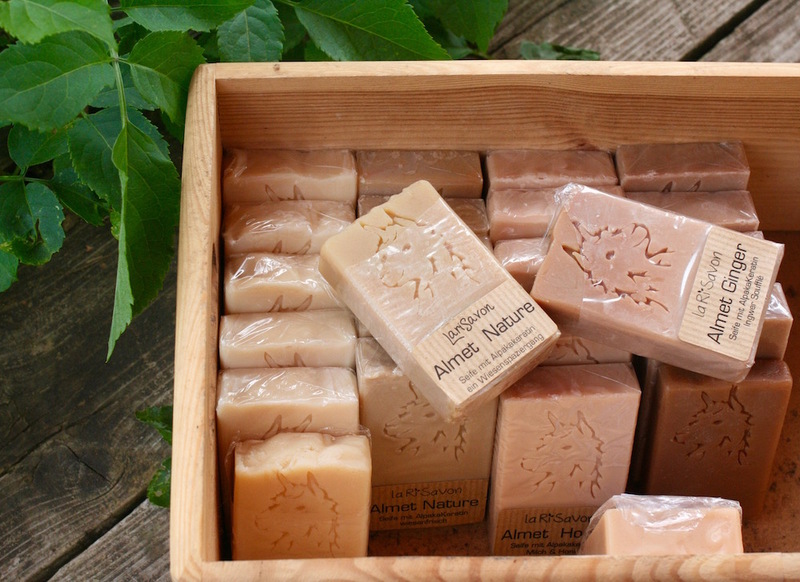 It is used for woven rugs, as a warm filling for duvets or even for a natural soap. School classes often visit the farm. Then Christiane explains to the kids the long but beautiful process from animal to a knitted sweater. 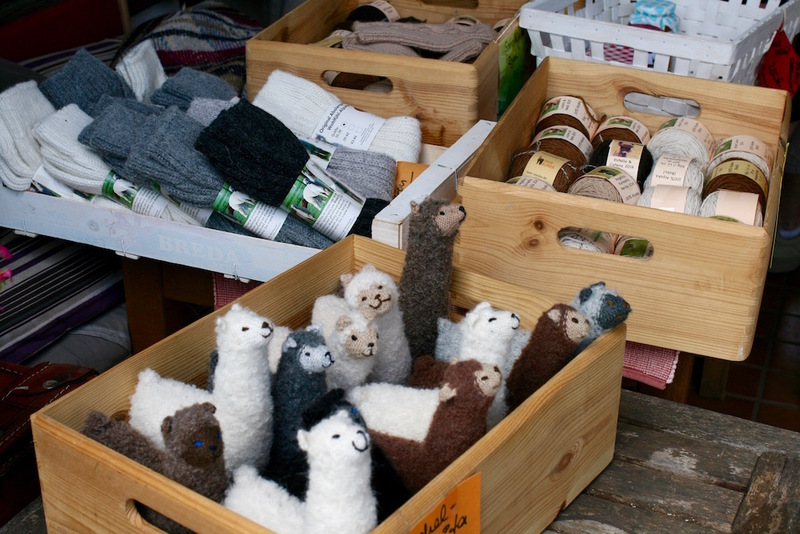 Maybe this raises awareness that it is hardly possible to get a fair alpaca sweater at H&M or Primark for 20 Euros. When I came back on a nice sunny Sunday in July, I wanted a quick interview with Christiane and Rainer. 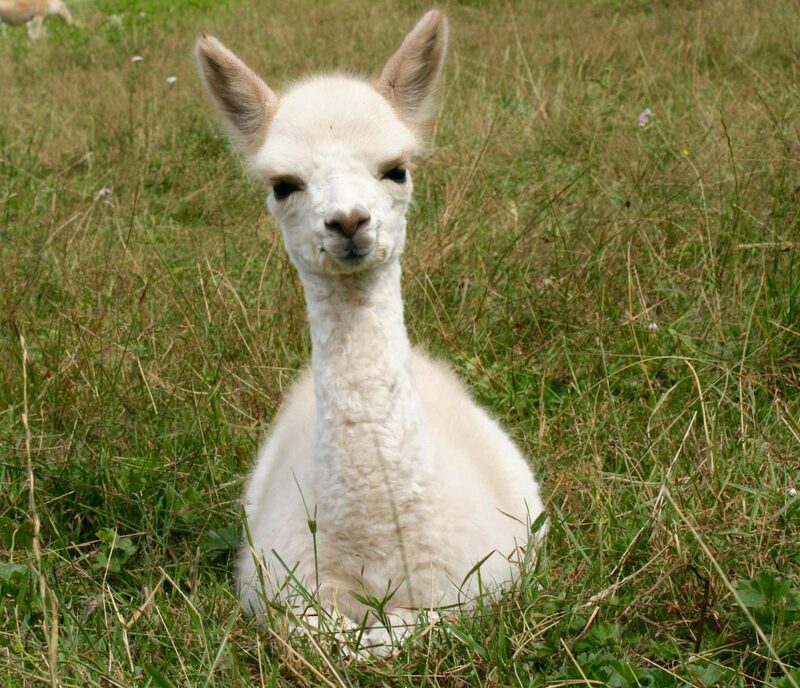 But I realised that when you are near alpacas nothing is quick. You immediately slow down and relax. Usually, to reach this state of relaxation, I have to take a yoga class ;-). Then Christiane offered me a sun chair to sit in the pasture with all the animals, maybe to take more pictures. Four hours later, I was still there.